For a while I have been considering changing up my hair color but I didn't want to commit to any chemical damage. However, recently, I have been researching the benefits of henna as a natural hair dye. Some of the things that I discovered is that henna is 100% chemical free, it's a great hair conditioner, and it makes hair shine. Also, it can be used more frequently than chemical hair dye without damaging the hair. Needless to say, I was sold. I bought a box of henna (red) as well as a box of indigo (blue henna). Henna is a plant and it grows naturally. It has a green appearance in powder form and smells like tea or potting soil in my opinion. Natural henna mixed with water has a brown appearance. When henna is applied to hair, it can change hair red depending on the shade of your hair, For gray hair, the results from natural henna will be fiery red. For blondes, henna can give hair a cooper or reddish color. For brown/black hair, henna may or may not produce any color at all because of the darkness of the hair. Color results definitely varies. Indigo is also a plant that grows naturally. It also has a green appearance in powder form and smells the same as Henna. Natural Indigo mixed with water has a dark blue/navy appearance. When indigo is applied to hair, it can change hair indigo blue depending on the shade of your hair. Just like natural henna, indigo color will have a greater pigmentation on lighter shades of hair. Also, if indigo is used after a henna application, it produces a pure black shade. 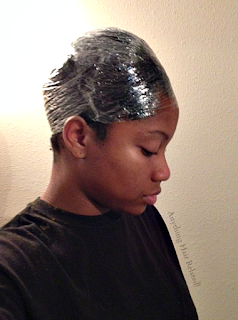 I've decided to use the henna and indigo two step process in order to achieve black hair. 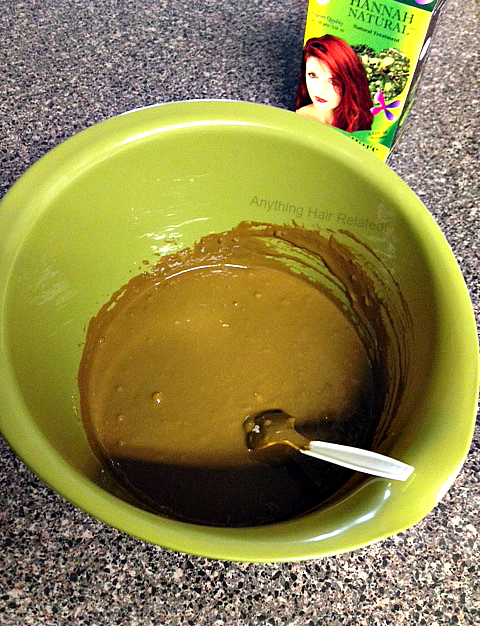 For starters, I poured the two packs of henna powder (50 grams each) into a bowl. I forgot to take pictures of what it looked like in powder form because I was too excited. Next, I mixed the henna with warm water. I poured in small amounts of water at a time in order to avoid lumps. However, I still had a lumpy mixture. The directions said that the henna should look like ketchup and my mixture looked like oatmeal. I was so determined to get a smooth mixture that I stirred for about 20 mins. My arm got a serious workout (A blender may come in handy on this part). After getting a smooth mixture, I covered the bowl for 8 hours and let the henna soak. Before applying the henna I applied a pre poo with coconut oil, honey, V05 conditioner, olive oil, and Jamaican black castor oil with lemongrass. 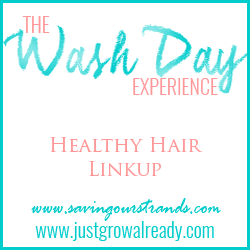 Next, I shampooed as usual with Organix Moroccan Creme Shampoo but I skipped conditioning. I blow dried my hair and applied the henna in small sections of my hair. I made sure to wear gloves because Henna stains. I liberally applied henna all over my head and stacked my hair on top of my head once I was finished. Henna with shampoo and blowdried my hair once more. Next, I mixed the Indigo with warm water in a large bowl and applied it to dry hair (according to the instructions). It was more difficult to apply Indigo and it was more watery. I applied the Indigo in the same way I did with the Henna. After completion, I wrapped my hair with plastic wrap and allowed the Indigo to sit for 1 hour. After an hour, I rinsed my hair with water in the bathtub. I simply leaned my head over in the tub and used a plastic cup to pour water onto my head. I used the same technique to rinse out the Henna. My hair was so dry as I was rinsing out the Indigo. I think it had something to do with how much I shampooed and blow dried. Next time, I think I'll skip shampooing and blowdrying before applying Indigo. 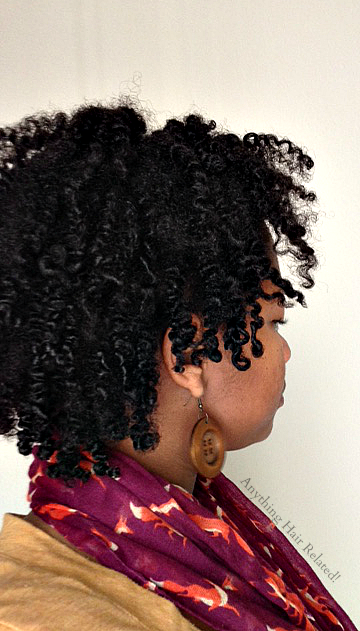 However, after washing the Indigo out, I applied my Miracle 7 deep conditioner and my hair was baby soft to the touch. That was a relief because my hair felt like straw. 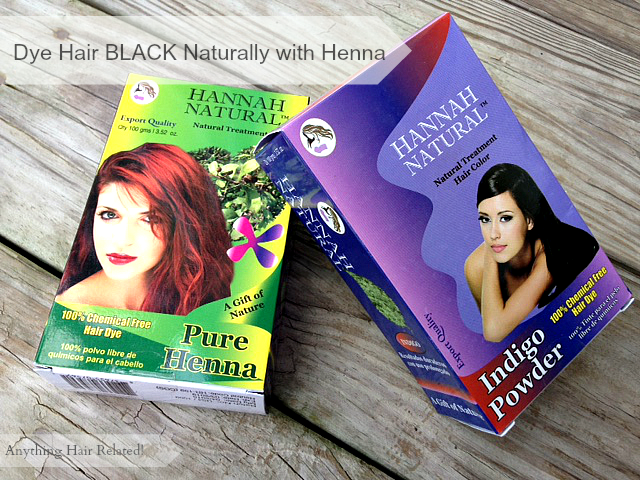 2 comments on "Dye Hair Black NATURALLY with Henna and Indigo Powder"
Henna has been on my "To Do" list for soooo long! I love your results! Do you think that you will do it again? Omg I love the results from henna. The process was a little messy and little dye flakes fell onto my clothes and fingers until my next wash. However, I loved the jet black color and shine. Also, my hair was so much more manageable. I'm sold and I'll be doing it again in a year.